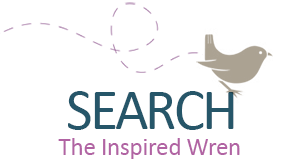 The Inspired Wren: Elephant Legs? Put Me in the Zoo! Elephant Legs? Put Me in the Zoo! 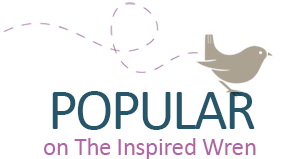 Piggie, Gerald, elephant legs, an ice-cream cone, and a tribute to Robert Lopshire, too! Week #1---"Put Me in the Zoo" Challenge. 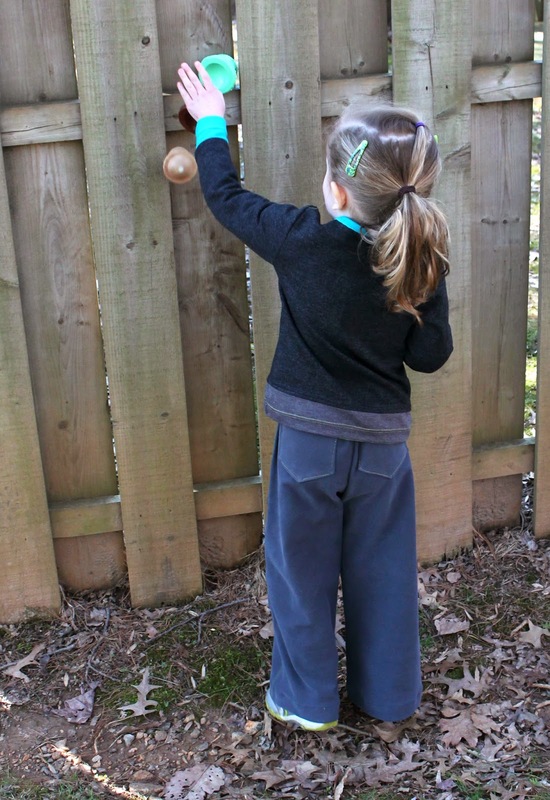 Take inspiration from your favorite (or your child's favorite animal) and design and construct an outfit. Remember to make it "inspired by" and not a literal costume. 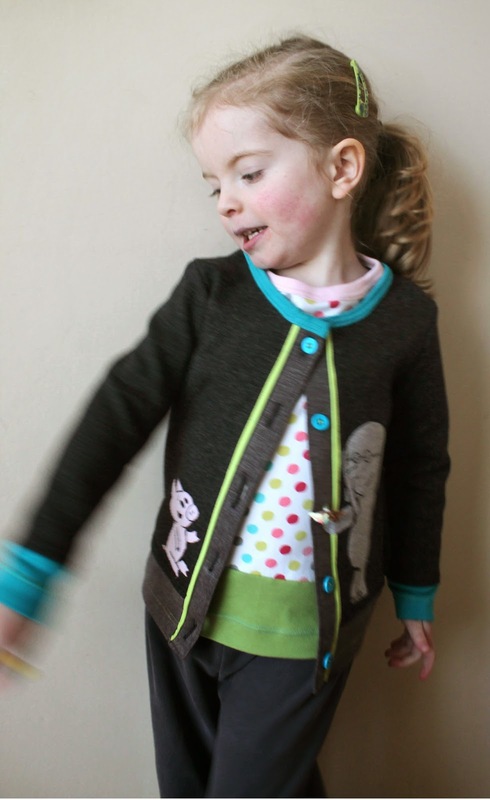 Loving the sweater/jacket even without the appliqué! Slightly modified pattern from Ottobre Design. When I realized I was stumped on this first challenge, I turned to The Peanut and asked her what her favorite animal is. "ALL OF THEM!" True. But not helpful. I briefly considered just making the yellow dress from Put Me in the Zoo,[affiliate link] but that really doesn't answer the challenge. It just so happens The Peanut turned 5 last week (five! ), and as I sought out decorations for her party I landed on her favorite fictional characters of the moment, three certain pigs: Peppa, Olivia, and Piggie (of "Elephant &" fame). Problem is, much like Olivia, I'm not a fan of pink. Then I also remembered that when we visit the zoo she makes a beeline for the elephants. Aha! Piggie and Elephant! Of course. Now if I was a formal contestant, not just sewing along for practice, I'd worry this doesn't answer the challenge directly. But since I'm not, I felt at liberty to create something I knew my model would LOVE to wear again and again. In Should I Share My Ice Cream by Mo Willems [affiliate link] -- Gerald imagines sharing his ice-cream cone with a clearly pleased Piggie. After I landed on this loose solution of a Mo Willems tribute, the pants seemed obvious: wide-legged and gray like the legs on Gerald himself. Elephants need back pockets for their spare peanuts, of course. Or in this case, their spare mini peanut butter cups. Now I was looking at an all-gray elephant outfit in need of color. 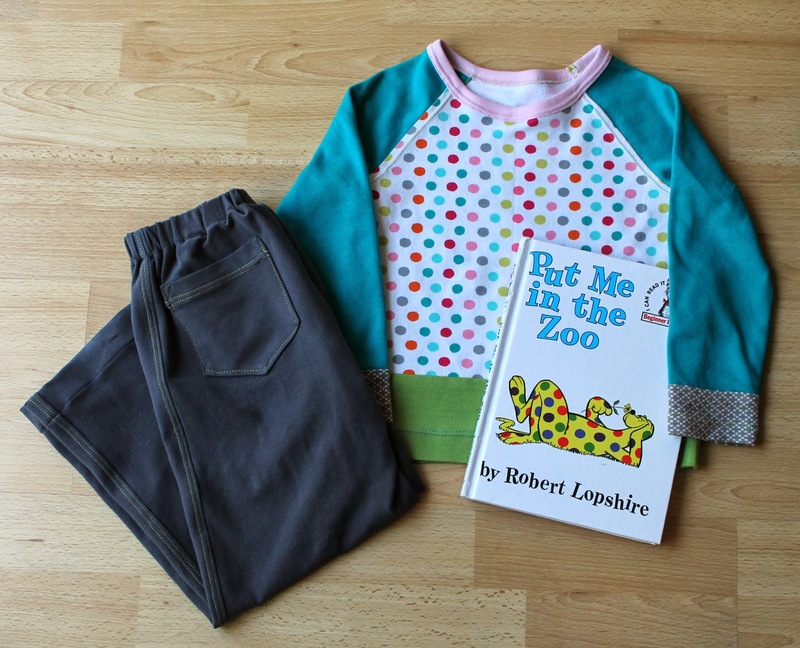 Since I had already referenced the actual Put Me in the Zoo [affiliate link] by Robert Lopshire, the solution fell into my lap in the form of multi-color polka dots! After that I let the color explode onto the raglan tee. This shirt may be the most colorful garment I've sewn to date. The twin needle once again got a workout on both the raglan-sleeved tee and the wide-legged pants. If you scroll down and you'll see my usual summary of patterns and fabrics. I'm especially proud of the appliqué. For those of you that don't know, I sew on a Singer 5817c from the mid-90s—in other words, completely manual, no computer chip or programming. And I definitely don't have an embroidery machine. Here's how I did it. Hand Appliqué: 1. Cut; 2. Iron & Sew; 3. Stitch; 4. Stitch some more. That ice-cream cone button rocks my world! But the wobble on the chartreuse trim burns my cookies. It wasn't until we came back in from the cold (it's the end of March, why is it cold?!) that I realized I didn't get any visible polka dot pics. Inside, low light? Oh! Look who's blurry again. I blame a sugar rush from the peanut butter cups. Also what's going on with that ice-cream cone button? So there you have it. My Elephant & Piggie (emphasis on elephant) plus Robert Lopshire homage as solution to Project Run & Play Week 1. 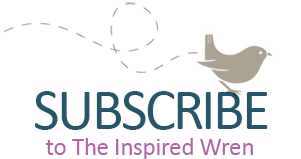 It's been ugly with the snow and the sick around these parts eating into my sewing & blogging time. Here's hoping we're through with snow days and sick days until after April 15th! 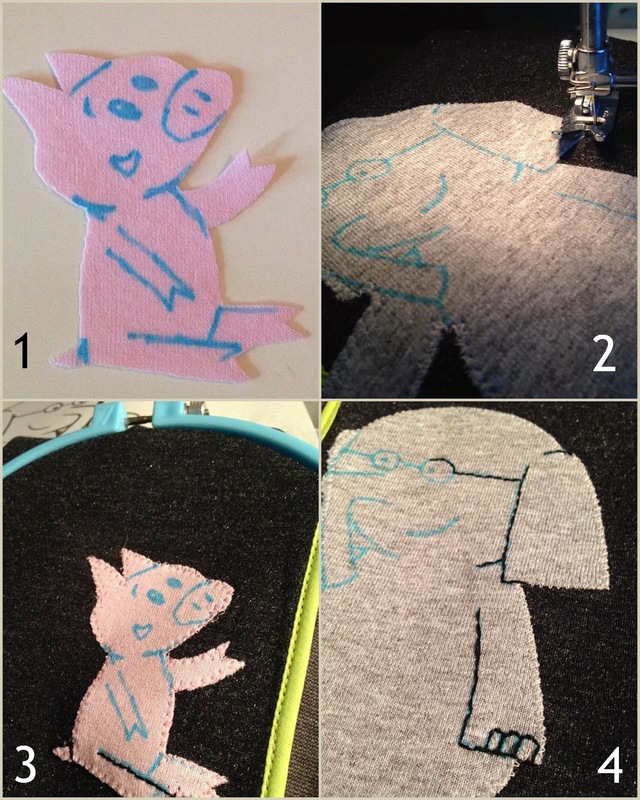 Click here to see all the great sew along entries! The popping, bright-accent color on neutral. Always. That ice-cream cone button. Those fun, colorful polka dots. I added the contrast trim and lowered the front neckline slightly on the jacket. And I added the twin-needle top-stitching on the pants. I really wish the weather and our health (just heavy colds, but still) hadn't slowed me down this week. I hated feeling rushed. I have so many more plans for the remainder of PRP, here's hoping they go smoother. Super cute! I am loving that applique!!! Great job! Thanks! I was thrilled it came out as well as it did. This is adorable! 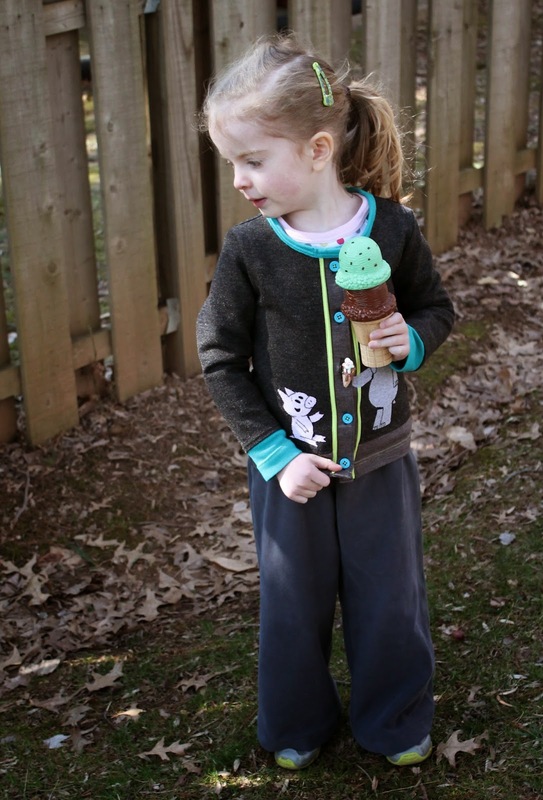 The applique is great - and LOVE the placement / use of the ice cream cone button! That button drove me crazy because I had seen it MONTHS ago. And then couldn't remember where (Joann's). It took me two trips to the same store (plus other stores in between) to find it again -- why I could see it when I wasn't looking for it but blind to it when I wanted it is beyond me. I was thrilled when I found it because it MAKES that appliqué! What a great outfit! I love all the colors together. And the button is adorable. My fave part is the front of the sweater, the way the teal and light green trim work so well together and the stitching at the waist. Great work! I agonized in the fabric store over that combo. I have a pile of knit right now that I pulled (from the store and from my stash) as I worked out how best to do it. I agree that in the end it was a good combo...but I stressed it as I sewed it. This is fantastic! I love everything about it. Thanks for sharing! 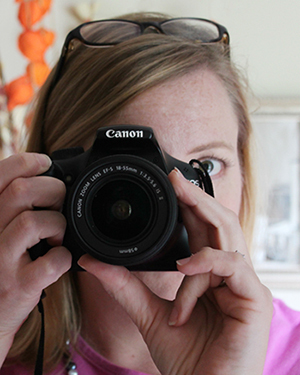 (I am a new follower and I found you on Diane's Vintage Zest. Thanks for the compliments. And thanks for following, too! I'm a fan of your inspired creation & I love how you added the dots inspired by a child's book to the shirt. Thanks. The polka dots were a lucky find. It helped that I walked into the store open-minded for the shirt to layer under -- I knew I wanted color but didn't have a clear idea. The dots jumped at me because I had sketched and thought and researched (the stories, at least) prior to going shopping. As soon as I saw them they were obvious to me. I sewed the front panels first (the waist band and button placket) just so I could place the characters in the right positions. Thanks for noticing! Super cute outfit! 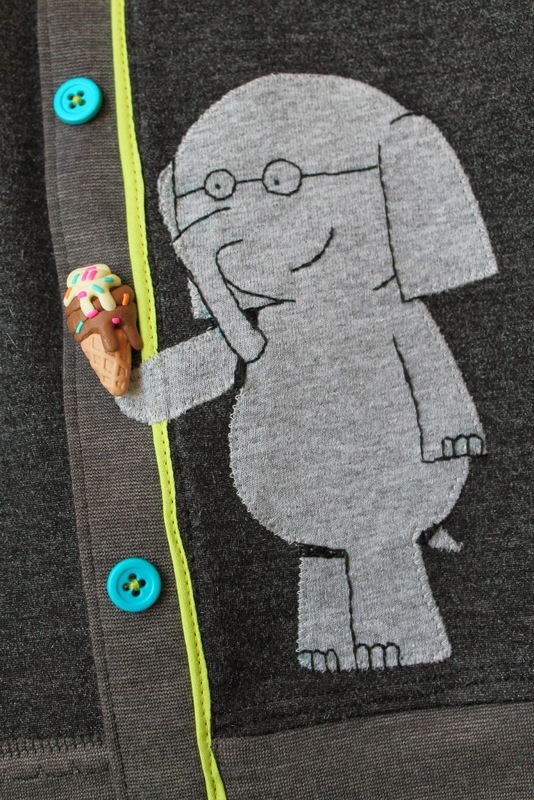 I love how Elephant is holding the ice cream button. My girls are also crazy about Piggie and Elephant. And Pigeon. And really, anything by Mo Willems. (Secret: I really love reading those books to my girls too!) Anyway, I really like that polka dot print and how the turquoise accents on the jacket call back to the shirt. Thank you. I think that's the way to make many colors work together -- they need to call back to each other. I'm glad you noticed. And yes! Any Mo Willems, any day. Come sit by me and I'll gladly read (or listen). I've yet to make a circle skirt for The Peanut. That yellow dress would have started there. Someday I will. WOW this is just adorable! We are huge Mo Willams fans here. You did an amazing job! I love how you fit the book into your outfit! 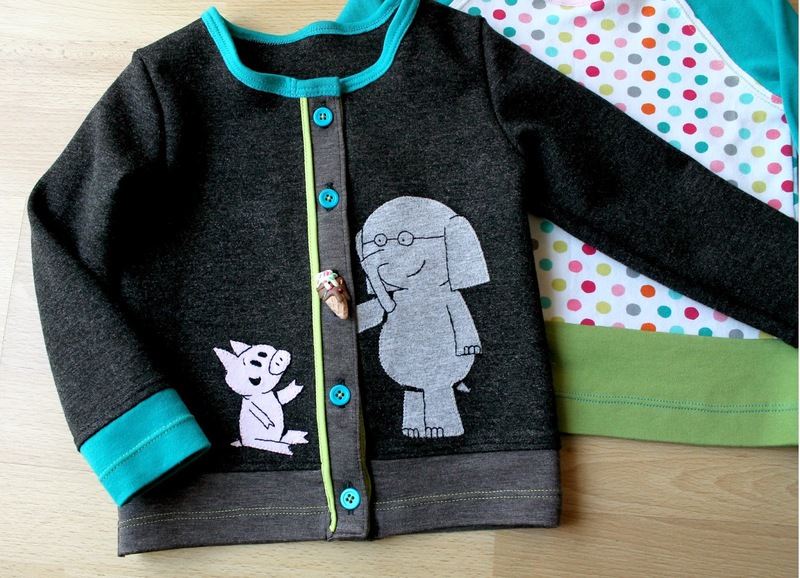 Those books are just perfect - the applique(s) is an adorable touch! So very, very cute! We used some (reverse) appliqué this week. Some ice cream too, but not on the buttons! Darling. Thanks! Your zebra and flamingo are adorable. So stinking cute and the button placement....GENIUS!!! Thanks! Once I knew I was doing Elephant & Piggie, I knew right away how I wanted to depict them. I almost bought a cupcake button when I couldn't immediately find the ice cream cone. so completely adorable!! I think you did an awesome job! I love your applique!!! What a cute outfit! 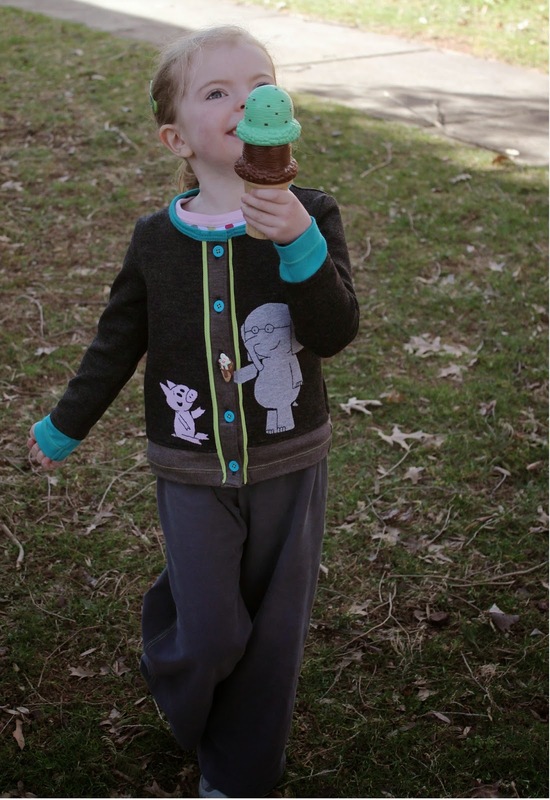 Brilliant appliqué with the ice cream button!!! Love it!!! Thanks! This one was a lot of fun to make. do you have a store?? I don't sew but my daughter is addicted to Elephant and Piggie! Anna, I don't have a store at this time. I find once I sew something one time, I'm ready to move on to a new project. Sewing multiples of any one thing makes me a little crazy and not-so-easy to live with. For the sake of my husband and daughter, I'll stay away from having a store for now. Sorry.